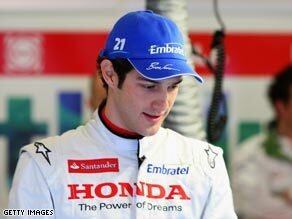 (CNN) -- Bruno Senna -- nephew of the legendary three-time world champion Ayrton Senna -- looks set to miss out on a drive in Formula One this season. Senna looks like missing out after testing with the former Honda team at the end of last year. Senna was widely tipped to replace fellow-Brazilian Rubens Barrichello in the former Honda team, but has apparently missed out. He told Brazil's Agencia Estadao that team chief Ross Brawn had canceled a scheduled meeting with him earlier this week. "I'm kind of resigned to trying something else," said Senna. "I'm just a little upset because this situation has dragged on for so long, making me lose better professional possibilities. "The important thing is to keep Formula One as the top priority. I will bounce back." The team, who lost the backing of Japanese car giants Honda late last year, are set to compete this season under the banner of Brawn Racing in a management buyout. With Britain's Jenson Button guaranteed a drive, Barrichello, who has a record 267 F1 starts under his belt, looks set to be favored because of his greater experience. This is a particular factor with new regulations banning in-season testing and precious little time for the team to prepare ahead of the start of the F1 season on March 29. Barrichello is confident he will be at the wheel. "My faith says that next week I'll be driving a competitive car in the tests in Barcelona," he told PA Sport. "I've lived four months of waiting, and I'm not going to celebrate before crossing the finish line."